Sinopec Group, China's second largest oil company, said yesterday it remains active in its efforts to bid for oilfields in Iraq despite being rebuffed in the second round of bidding. "Sinopec is still in talks with the Iraqi government over the bid," said a source from Sinopec who declined to be named. Sinopec's offer to pay participation fees to bid for oilfields on offer in Iraq's second bidding round was rebuffed by the Iraqi government due to Sinopec's existing deals with the Kurdish regional government, Reuters reported. In June, Sinopec agreed to buy Swiss oil explorer Addax Petroleum Corp for $7.3 billion, which had signed deals with the Kurdish authorities in northern Iraq. The source from Sinopec said the contract with Addax was not likely to affect Sinopec's other businesses in Iraq, based, as it was, on an evaluation it did before purchasing the Swiss oil company. Baghdad's refusal, however, indicated that the Addax deal clearly had a negative impact on Sinopec's effort to further tap oil reserves in Iraq. "Sinopec asked to pay the participation fee to get the data package but we refused due to the deals they have with the Kurdish regional government," Reuters quoted Sabah Abdul Kadhim, head of the legal and commercial section of the Petroleum Contracts and Licensing Directorate, as saying. Iraq's central government and the Kurdish authorities are at loggerheads over a range of issues including oil. 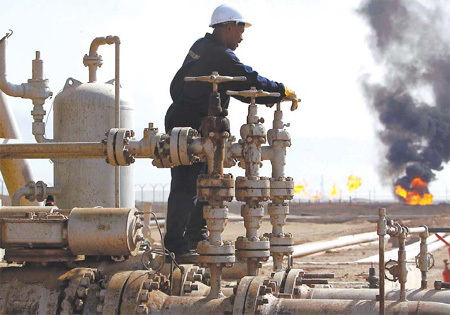 The oil ministry of Iraq considers deals signed by the Kurdish authorities with oil firms to be illegal. "Our position is clear. We will not deal with any oil companies that sign contracts with the Kurdish authorities without the approval of the central government," Kadhim was quoted as saying. Analysts said the failure of Sinopec in its bidding effort indicates that it is still not easy for Chinese oil producers to acquire overseas oil assets when deals are intertwined with sensitive political issues. "Oil, unlike many other resources, is closely linked with national interests and political issues," said Lin Boqiang, director of the China Center for Energy Economics Research at Xiamen University. "It is still not easy for Chinese oil companies to tap overseas oil reserves when resources become intertwined with political interests," he said. Lin, however, noted that Sinopec was not likely to give up easily and was expected to continue in its efforts to bid for Iraqi oilfields to expand its upstream oil asset overseas.